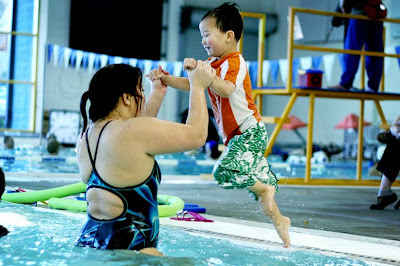 Thomas recently finished up the latest term of swimming lessons. We were a little concerned at first that he may be out of his depth (haha) without Mummy or Daddy in the pool with him, but by the end of the 8 weeks he was blowing bubbles and putting (most) of his head underwater. I was even able to witness him going down the slide and jumping in. Unfortunately we weren’t able to get Thomas enrolled in the next series of classes because they ran out of room, but we are committed to taking him to the pool more often to make sure he retains his comfort level.